The group meets at 7 a.m. in the parking lot near the Bethesda Panera at 7201 Wisconsin Ave. While looking to make healthier lifestyle choices, Mike heard about the Montgomery County Road Runners Club’s (MCRRC) First Time Marathoners (FTM) program and decided to join. 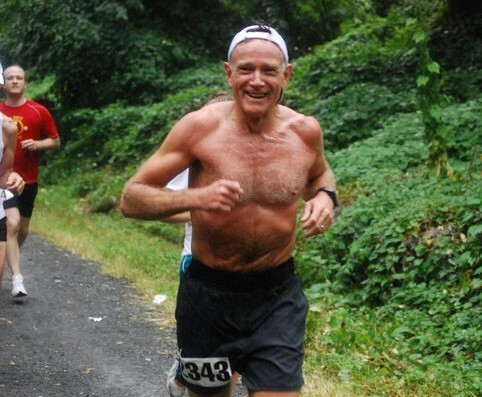 He was hooked, and before he knew it he was running marathons and very soon after–ultra-marathons. Any free time he had he spent immersing himself in all things running. Around this time, Mike was tiring of practicing law and wanted to have a more positive impact on those around him. He felt that coaching was the perfect way to fulfill that need. Before long, Mike had taken the coursework and certifications to become a personal trainer and a certified running coach. Eventually, he took over the FTM program and spent a few years as the head coach. In 2002, Mike Broderick, founded MCRRC’s Experienced Marathoners (XMP) program to fill that need. The first year there were 66 runners and four coaches. Steve Hays was one of those coaches. Broderick’s XMP training program consisted of a solid base of easy miles with long runs conducted at a much slower pace than a runner’s anticipated marathon pace. It also included weekly track workouts and a tempo day with higher mileage, including about half at marathon pace. Runners were separated into pace groups based upon recent race results, and paces for each specific workout were calculated from that data for each runner. By this time, Mike had stepped away from his law practice and was providing coaching services to individuals while also coaching XMP during the summers. Meanwhile, he was continuing to learn, study and gain expertise in his newfound passion. 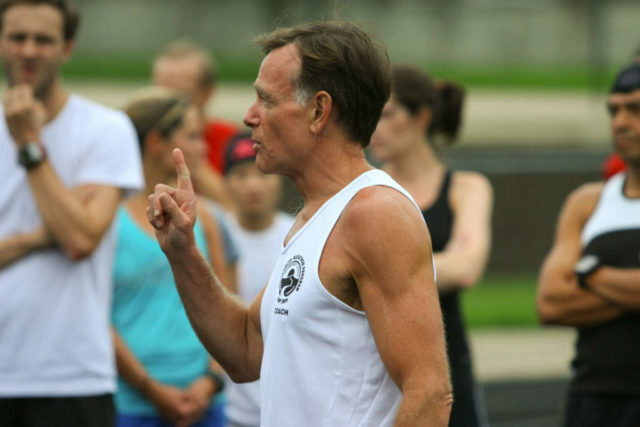 He gained higher levels of certification through the Road Runners Club of America and through USA Track & Field, and before long he was teaching the coaching certification courses to aspiring coaches all over the country. He had become the coach’s coach. Broderick quickly recognized that because XMP was producing so many Boston qualifiers that there may be a viable market for creating a winter training program designed to prepare these runners for the Boston Marathon in April. The Boston Bound program was born in 2008 and was comprised of nearly 50 runners–virtually all of them from the XMP program. The program was not affiliated with MCRRC and was operated as a small business by Broderick. To add value to the challenging program, Broderick added a weight-training component and more specialized coaching, including guest speakers every other week focusing on science, nutrition, strength training and injury prevention. He also provided a high-end premium for runners, and a few weeks before the race runners participated in a simulated mock long-run where runners could practice all aspects of their Boston Marathon race day experience–from clothing choices to nutrition–as preparation. It was unique. The program was a success through the spring of 2011 despite Mike’s passing in late 2010. However, for a variety of reasons the coaches chose not to continue the program in 2012. Thankfully, XMP and Boston Bound participant Julie Sapper teamed with a few other club members to keep the program alive. The program was renamed Broderick to Boston –B2B for short–in Mike’s honor and has grown each year since. Broderick to Boston is now in its eighth year as a free program. It remains unaffiliated with MCRRC and the Facebook page boasts 350 participants. 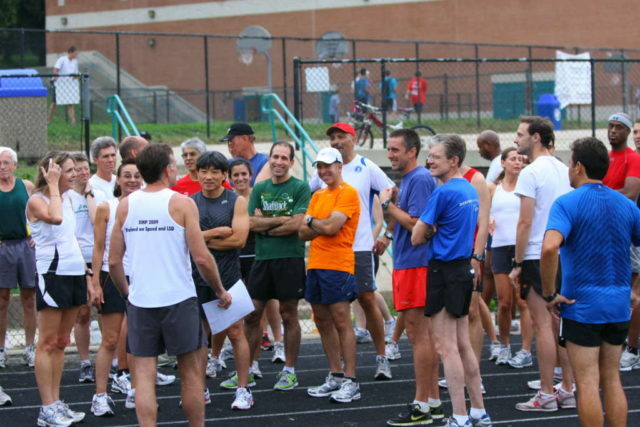 As many as 75 runners meet each Saturday morning in Bethesda to train together, running distances from 16 to 22 miles from January through April. Nearly all of them plan to run the Boston Marathon this year. Perhaps one of the greatest legacies that Broderick left behind was inspiring so many runners to become certified coaches themselves. The B2B program has more than a dozen within its ranks. “The fact that B2B continues and the fact that so many people take so much pride in making sure it continues is a testament to how much Mike meant to everybody,” said Hays.